The progression that is the discovery and appreciation of photography is a journey unique to the voyager. Whether the path is walked through a textbook, an online forum, or alone, there is not two that are alike. Being self taught I found myself obsessing with the technical to a degree that the artistic side of photography was an afterthought. At first it was just grasping the concept of 18% grey, then it was learning the stop reach of my sensor, then it was getting rid of depth of field only to bring it back in later years. It serves a little ironic that I craved bokeh so much when young and now I cringe whenever someone uses that word in a conversation. Back in 2003, I found myself with a lens line up that from 24 to 200, all faster than f/1.8, so to say I enjoyed dof isolation was an understatement. However, there was a part of me that thought the 85mm f/1.2 just wasn’t shallow enough. I had tubed the thing beyond its nodal point reach to where the min focus point was behind the front element. However, a part of me still felt there was less depth to be achieved. This quest impacted my grades as I would often sit in Italian classes trying to calculate the angle of light conversion for a lens instead of paying attention (2 years of Italian and all I know is how to say my name is cheese). Being a true photo geek at heart, I listed lenses by absolute aperture size in mm rather than stop (this is before I learned the factoring of min foc distance, but that is a function or mid to rear elements, so we can address it at a later time). Fortunate for me during this time, there was an industrial factory that did X-ray analysis that had gone under and surplussed it’s equipment. I called them up and offered to buy all their lenses for cheap as I intended to mount them to a Canon 1D. 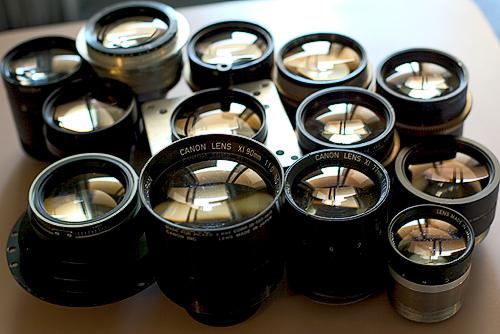 The lenses that came in the box ranged from 110mm to 50mm and had aperture values of 1.1 to 0.50. Unfortunately, they were made for industrial X-ray machines, so mounting them would not be easy. 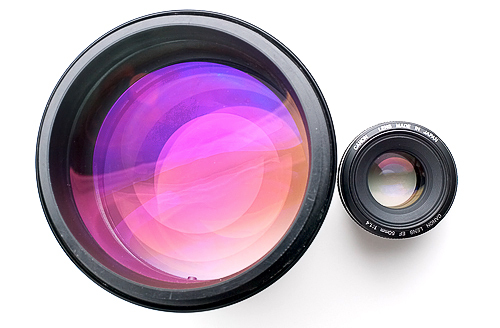 Some had nodal points that wouldn’t work with a mirror and others had rear elements that would support the lens. None of them had focus rings and would be strictly DTS pulled, not to mention no chips meant that the truest form of manual exposure would be required as most cameras aren’t set for f/.50. I eventually mounted some with cut body caps and others with plumbing tubing with a CD case. Min focus distance was very min, often only a couple inches, but dof is a function of distance as it is a derivative of iris, so this was a plus. There was not a practical use for the lenses, but there was learning to be had in their use. I taught myself lights change and dof relevance on it. Texture was important and the quality of the images that came from the lenses was often determined by the progression from focus to out of focus rather than the quality of the blur itself. At the end of the day, I never really showed the images all that much and sold off most of the lenses I had made. Like so many other aspects of photography, I was merely looking to show myself I could do it. Did you do any shots of people? Would be exciting to see some extreme shallow DOF … ! When I was young it was all about the extreme telephoto. Now I go as wide as I can get without things looking stupid. Interesting project with the lens acquisition. SOmetimes you just need to show yorself “you can”. 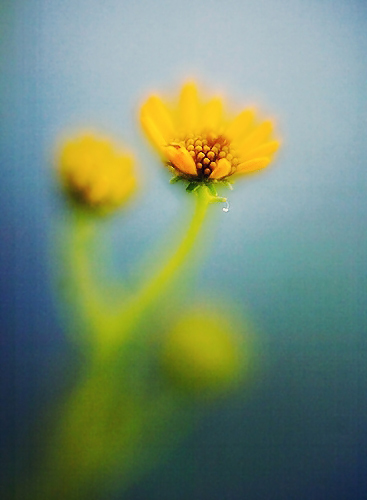 Bokeh – it’s serendipitous when it happens and compliments the image. I don’t especially seek it unless a project calls for it. Hey, I have some little mat black heart and star cutouts I can send you LOL. Sir – you should post all the photos online for all to see and amaze. We all like to tinker and experiment, this is the truest way of learning and exploration. Even though you have no practical use for your creation, I’m sure you’ve applied what you’ve learned as a result many times over in a practical way. So, again, cheers and thank you posting. I stil think Lenbabies makes a decent job. My 3g is awesome. the light in the photos are just superb. This is delightful-thank you for sharing this adventure in obsession for exploring the unknown. I’ve had a few adventures into these unmapped caves of curiosity-mostly with camera obscura….and some that remain to be fully explored. Even if nothing immediately useful turns up, there’s something satisfying in the attempt.